In order to address the specific problems of dehydrated, lipid deficient or mature hands, Biologique Recherche has developed a complete repairing and hydrating treatment, the Emulsion Rénovatrice Mains, designed to promote lipid synthesis and increase water content. The epidermis of the hands is naturally poorly moisturised, which results in virtually constant dehydration and a fast ageing process. We are constantly using our hands, and they are continually subjected to stress in our daily activities: ultra-violet radiations from the sun, wind, cold, hot water, detergents, dust, smoking, other materials… All these factors dehydrate the hands and make the skin more sensitive. The hydrolipidic film is weakened and aggressed and can no longer act as a protective barrier. Our hands therefore require particular attention and specific treatment that respects them and protects them against all these external aggressions. 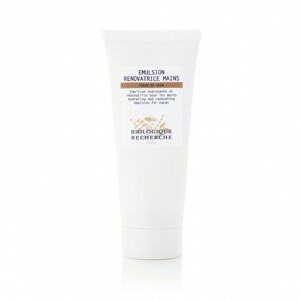 Ideal for dehydrated, lipid-deficient and weakened hands. Moisturising agents: Cottonseed Oil, Hyaluronic Acid and Rhizobium Complex, Biotechnological Polysaccharide. Lipid-replenishing agents: Pichia Anomala Extract, Avocado Oil, Cumaru Oil. Protective agents: Shea Butter, Rosemary Oil Extract.